WOW! A new Horrible game! In two different versions! You had the first taste at GenCon, now it’s time for the real deal! After the succesfull preview launch in Indianapolis, our newest Horrible game, Railroad Ink™, will be released next October during the SPIEL fair in Essen, Germany. 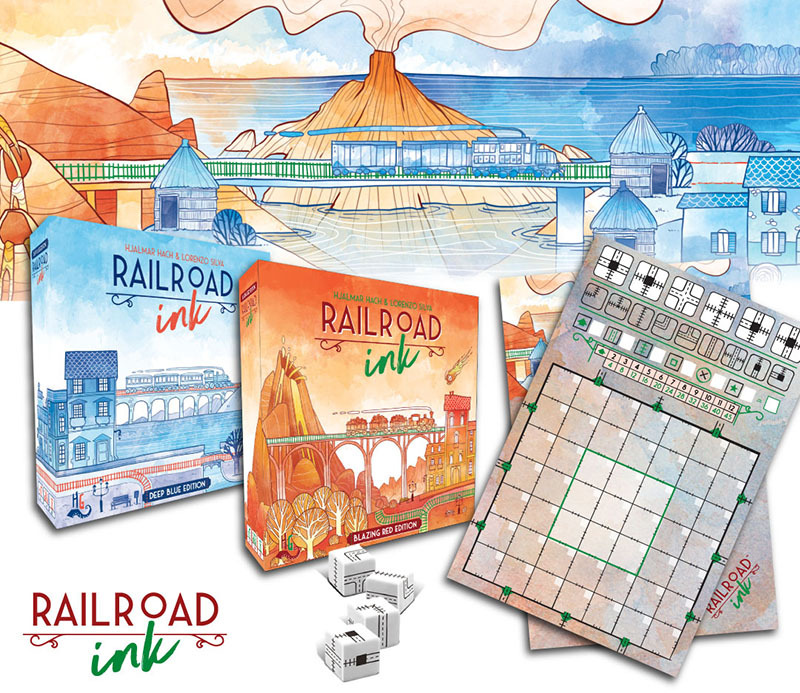 Railroad Ink™ is a multiplayer roll & write puzzle game. Roll the dice in the middle of the table, draw the routes on your erasable boards to create transport lines and connect your exits to score points at the end of the game! 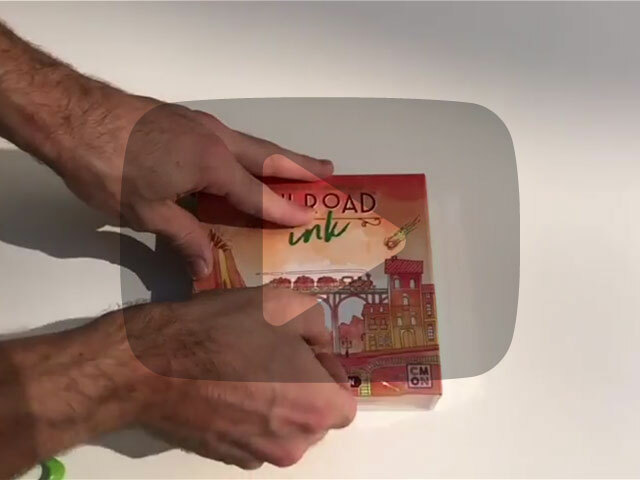 Railroad Ink™ comes in two versions. The Deep Blue Edition includes the River and Lake expansions. Increase the difficulty by adding the River route into the mix, or use the Lakes to connect your networks by ferry. The Blazing Red Edition includes the Lava and Meteor expansions. Try to confine the lava coming from the erupting volcano before it destroys your routes, or deal with the havoc brought by the meteor strikes and mine the craters for precious ore.
Each box allows you to play from 1 to 6 players, and if you combine more boxes, you can play with up to 12 players (or more). The only limit to the number of players is the number of boards you have! If you buy both editions at our booth in Essen, you will also receive an extra promo board with custom artwork and an extra marker. Used together with the components included in the Deep Blue and the Blazing Red editions, it will allow you play with up to 13 players! Also, don’t miss the chance to have your copies autographed by Marta Tranquilli, the author of all the game artwork! Marta will be at our booth Friday 26 October from 15:00 to 16:00, and Saturday 27 October from 11:00 to 12:30. We hope to see you in Essen, and be prepared! Something HORRIBLE is coming, and we hope you’ll like it!